In Ireland fascination with flying and aviation is deeply rooted and strongly present. It has a long history that goes back to “Buile Shuibhne” (“The Madness of Sweeney”), a 12th century poetic narrative, which tells a story of a 7th century Ulster king Suibne Geil who lost his mind and became a birdman, flying to various regions of Ireland from treetop to treetop. And nowadays, according to various surveys, the Irish are considered to be the most frequent flyers in the world. Have you ever thought about what it feels like to lift off the ground, levitate, ascend higher and higher and finally soar, achieving a unique and ultimate sense of freedom? To become a first one ever to touch the sky, a bird, an angel, a superhero? 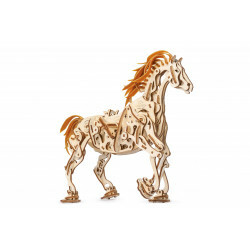 Now you can make your wishes come true, and let your imagination run wild. 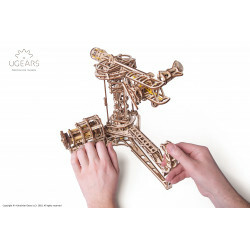 Please meet Ugears new model - the Aviatior, with not just one, but two flying apparatuses in one kit. 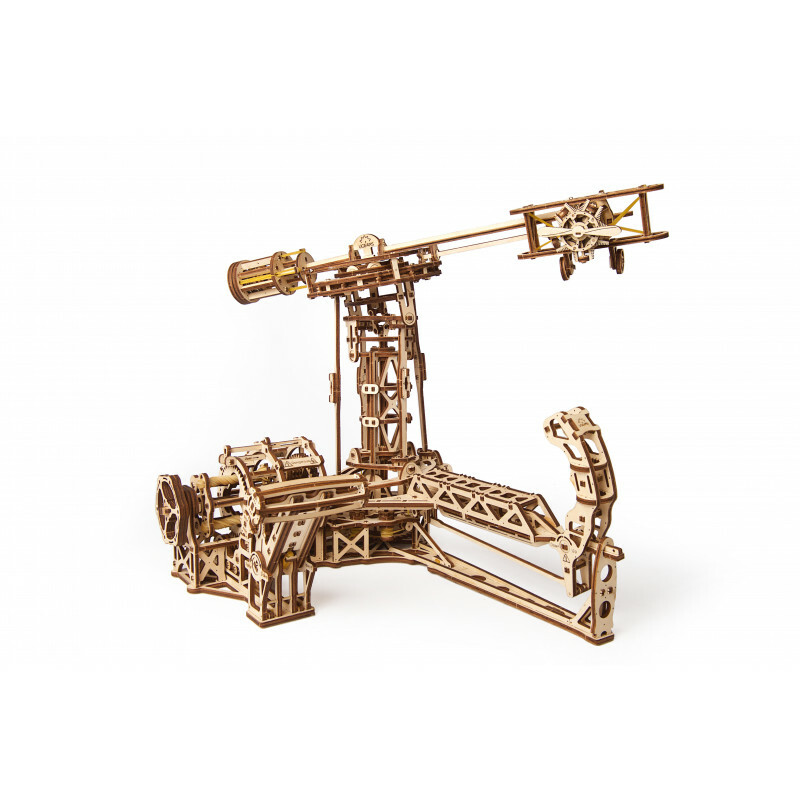 The set consists of three modules: the helicopter, the airplane, and the flight control tower. Select your aircraft, set it on the tower bar and prepare for take-off. For the neophyte pilots we recommend choosing the helicopter first because it is easier to operate. 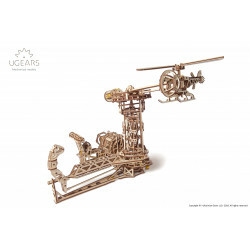 Quite exciting and not difficult to control, your copter has three-blade main and tail rotors and a cockpit with opening and shutting doors. The airplane can achieve a higher velocity and one must develop a certain skill to be able to fly it. 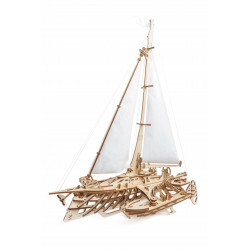 This model is based on the wire-braced biplane and has a 5 piston motor. Like in real life, in order to become a good pilot and to learn how to masterfully operate the aircraft one might want to put several hours of practice in it, but it’s all good old fun! Besides, you would probably have some practice by now if you started with flying your chopper. Nine-tenths confidence and one-tenth common sense equals successful aviator. 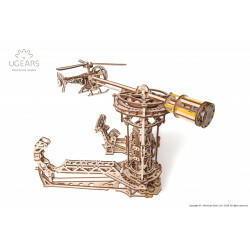 However, your cockpit is the control tower, a sophisticated device that has an efficient engine, powering the rotation of the swash plate with the bar; it has an aircraft on one side and balance weight on the opposite one. 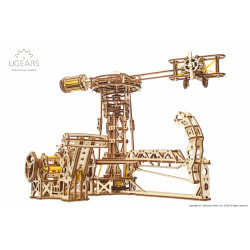 - the motor controller to adjust RPM (revolutions per minute) establishes the speed of the flying apparatus. Fine tuning guarantees efficient functioning of the swash plate. When all three units are put together and you are ready to take off, it is time to wind up the engine. Do not overextend the rubber bands in the motor with maximum winding of 25 half-turns. Hold on to the control column as you release the engine controller’s lock to launch your air bird. 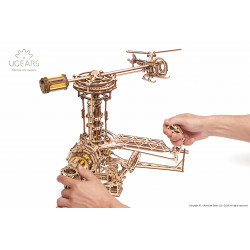 Take your passion for flying to the next level with your new Aviator model from Ugears: there is a great difference between a pilot and an aviator. One is a technician, the other is an artist in love with flight. 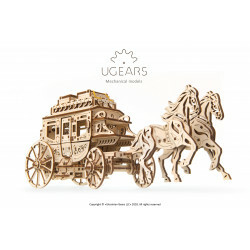 The Ugears Aviator model kit is made of sustainably sourced high grade wood and has everything you need for assembly. 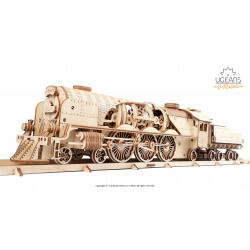 The quality of the parts is top-notch: a laser method is used for cutting items from a plywood board ensuring precise hairline cuts. 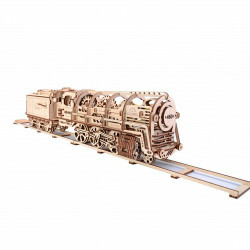 The details need to be pulled out of the boards and assembled to create a functional model. 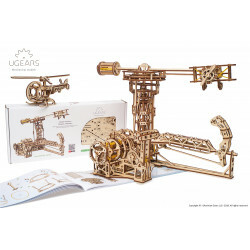 The Aviator comes with step-by-step full-color easy to follow instructions in 11 languages and does not require glue or any special tools to be put together into functional flying model.